Neve, the daughter of Annette and George Badalow of Davisburg, will join the Michigan Tech Huskies soccer team to play midfield and plans to study biological sciences. Her accomplishments include being named 3rd Team All-State and All-league, as well as playing on Marian’s Michigan High School State Soccer Championship teams in 2017 and 2018. Jansen, daughter of Clara and Brian Eichenlaub of Bloomfield Hills, is looking forward to playing soccer as a forward and studying computer science at the University of Virginia next fall. Jansen is a member of the National Honor Society. Her soccer recognitions include 2017-18 Gatorade Michigan Soccer Player of the Year; 1st Team Spring All-American (Top Drawer Soccer), All-USA Girls soccer; 3rd Team (USA Today Sports-Top 33 in Nation); Detroit Free Press Soccer Player of the Year; MLive Detroit Soccer Player of the Year; Michigan Dream Team: Top 11 (2017 and 2018); 1st Team All-State (2017 and 2018). She is also recognized in track as a State Champion Sprinter (4x400) and State Runner-up (4x400), and is an eight-time Regional Champion. Claire, daughter of Amy and David Stechow of Oakland, will be joining the tennis team at Wittenberg University next fall where she plans to study engineering. Claire’s many notable accomplishments during her time on the tennis team started Freshman year when she was a State Champion. Her Sophomore year included 3rd place State Championship finishes in both her flight and as a team overall. At the State Championship her Junior year, she was a finalist in her flight while the team was also a finalist overall. Claire served as a varsity tennis captain for two years. While at Marian, Claire also played field hockey, and is involved in the ambassador club, the National Honor Society, and went to Guatemala on a mission trip. Katie, daughter of Keri and Joe Sullivan of Ferndale, will play soccer for Western Michigan University next fall. She was a member of Marian’s Michigan High School State Soccer Championship teams in 2017 and 2018. 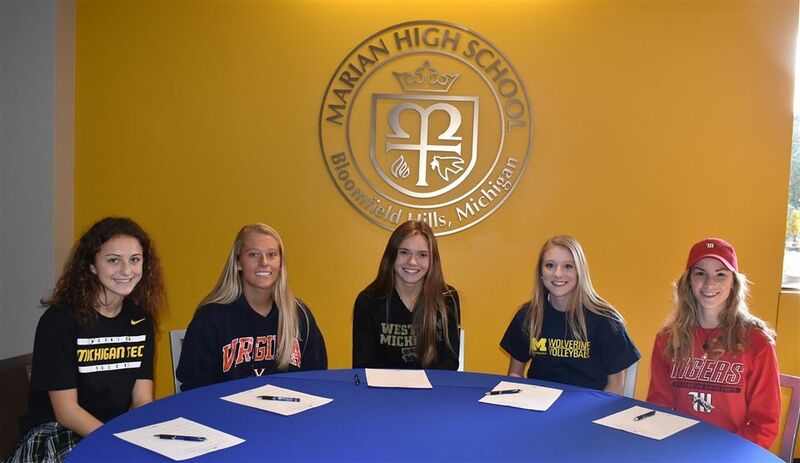 Mallory, daughter of Saundra and Thomas Lynch of Northville, will be joining the volleyball team at the University of Michigan-Dearborn next fall. She played varsity volleyball all four years, three of which she started in the libero position, and has been a volunteer Religious Ed Teacher at St. James Catholic Church since 2016.